In mountain sports, safety always comes first, which is why carabiners should be part of any climber's equipment. Robust carabiners are compulsory for climbers and mountaineers for their life is hanging by a rope. 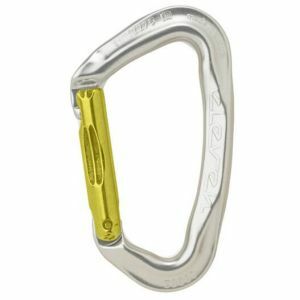 For reasons of weight, almost all modern carabiners are made of aluminium. Apart from carabiners for climbing, there are also so-called equipment carabiners. You can use them to attach all your equipment to your climbing harness. However, due to their lower load capacity, they are not suitable for climbing. Which carabiner do I need for conquering the mountain? In the past years, climbing has become extremely popular and the range of available high-quality carabiners has grown accordingly. And yet, this jungle of carabiners isn't too difficult to cross. The perfect carabiner is light, particularly strong, and easy to use. But above all, it should not open by itself. This leads us to one of the most important questions when it comes to buying a carabiner: Which one is the right locking system? When you're in a rush, i.e. when you're preparing a belay point, the non-locking carabiner comes into play. Locking carabiners are used when a situation requires 100% safety, i.e. when you're belaying yourself or your partner. These carabiners are available as locking carabiners or with automatic locking systems. However, you should always make sure that the closure is locked firmly and securely. You don't want a rock or the friction of your rope to open your carabiner. Nevertheless, you can rely on the high quality and safety of products by modern renowned manufacturers.